Direct power trading is a key topic that is of great interest, as it pushes the marketization of electricity trading in China. Participating generators may be able to maximize their utilization hours, and local industries have the opportunity to create better deals for their energy consumption. Shandong is actively incentivizing clean-energy and cross-regional market transactions. Renewables capacity is expected to increase by 16% in less than 2 years. The province is currently promoting non-coal energy sources.The premium localization between Beijing and Shanghai offers huge potentialities for energy tradings. The development of UHV transmissions channels will generate high opportunities also for the neighboring provinces. Renewable energy is currently accounting for more than half of installed power capacity in Fujian. During the first quarter of 2018, nuclear power satisfied almost 60% of transactions in the province. Renewables are expected to represent a solution to support the continuous growth of demand in the area.Distribution networks development will support new power stations construction, offering the possibility to rely on other provinces demands and increasing power plants utilization hours. The shift toward a more flexible power trading model is in line with recent market reforms, and ideally will usher in fairer market pricing structures in electricity sales. 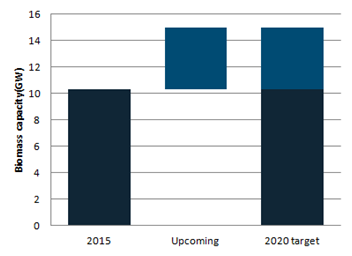 Energy administrations are, by law, required to publish year-ahead energy consumption and generation forecasts. Due to a number of political and economic concerns, there is a growing importance being placed on the actual utilization of renewable energy resources. While developers continue to add wind and solar capacity at unprecedented rates, grid connection and energy utilization are two pressing concerns that the NEA is beginning to address more aggressively. Azure is able to model and forecast curtailment levels of wind and solar projects at the provincial level. The line will connect via lower voltage lines to wind farms in 8 cities, guaranteeing grid offtake and tackling the high wind curtailment problem in North China. 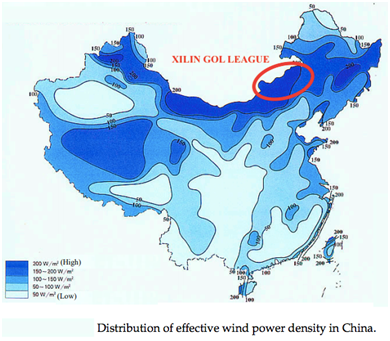 This will in turn enable new growth for Xinlin Gol league in which new large wind farms are planned. The NDRC announced and approved a new program to address the oversupply and underutilization of renewable energy in IMAR, Gansu, and Jilin provinces. Gansu province, with an annual electricity consumption rate of 110 TWh, has a 60 TWh oversupply of power generation. Inner Mogolia, with 104GW total installed capacity, has 10GW more thermal power generation than needed in the West, and 6GW excess thermal power generation in the East. Lastly, Jilin province, with 70.4TWh annual generation, produces 40 TWh excess capacity annually. The excess capacity, poor grid connection, and a number of other factors all lead to high renewable energy curtailment rates in these provinces. Apparently, the NDRC is testing the waters with how an increasingly open power market will impact curtailment rates and other grid inefficiencies. The plan includes 6 offshore wind farms currently under construction with capacity of 1,618MW and 10 new offshore wind farms with capacity of 3,650MW (see detailed breakdown of project owners from our database below). 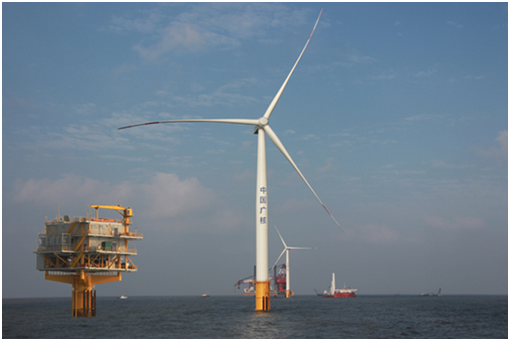 The total capacity of 5.27 GW is lower but more realistic than the 10 GW of offshore wind which was earlier announced as part of the "Thirteenth Five-Year Plan"(2016-2020) for the Development of Marine Economy in Guangdong Province by 2020. However we advise wind investors to correlate these provincial level plans with national level NEA targets over the same period in order to assess any potential grid connection and FIT risk. 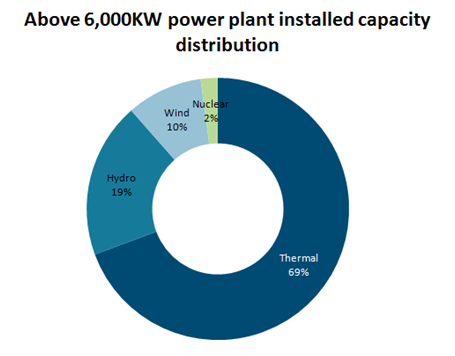 Distributed wind power plants with a voltage level of 110 kV (66 kV in the northeast region) can only have one grid connection point and a total capacity within 50 MW. Currently, centralized (non-distributed) wind projects have to wait in line to be included on the NEA subsidy list, sometimes for many years. The new policy which simplifies the development process and offers bettter guarantees to project owners was greatly awaited by the whole industry, with hopes that it will help boost the installations in coming years, which was greatly expected by small developpers as well. The 7MW machines to be supplied by ShangHai Electric under a license with Siemens are the largest wind turbines in China so far. While the average decreased, the utilization hours per province varies greatly. Yunnan and Sichuan provinces, for example, were at 1,441 and 1,377 hours, respectively. Due to the major difficulties integrated wind, lower user demand, and lack of sufficient transmission capacity, Xinjiang, Gansu, Jilin, and Ningxia provinces all had less than 680 utilization hours. Gansu is aware of this situation and, as discussed later, is attempting to increase utilization hours with a storage plant solution. While generation levels remain healthy, underneath the surface we expect to see mid-term impacts from the lack of quality transmission lines in the region and demand growth. Azure is tracking the provincial markets for economic signals. Typical growth is not typical in China — there have been consecutive growth years in the 10%+ range, followed by either a single digit contraction or flat growth. 3.5% is an aggressive growth number for an established energy base, however, for China, this is still a healthy level and we'll need a few more years of data to see if 3.5% represents the new normal. The NEA released a report highlighting the end of year 2015 national renewable energy data. 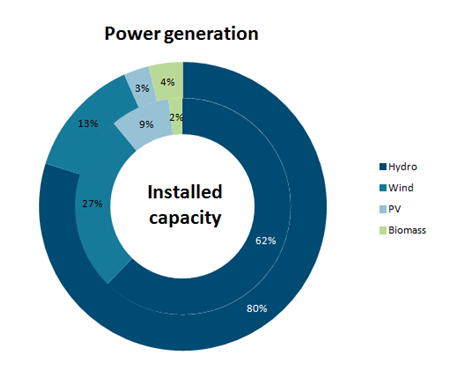 Total installed capacity of all renewable energy sources stood at 480 GW. 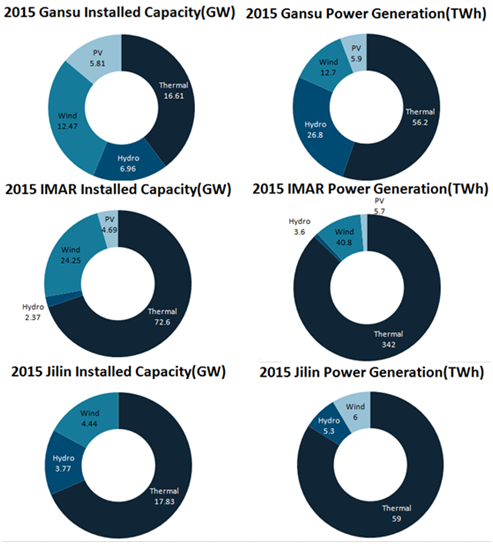 The installed capacity and annual generation for each resource is shown below. Total generation figures stand at 1,363 TWh, approximately 24.5% of total power demand. Excluding hydro, however, paints a less rosy picture of 278 TWh and 5% of total power demand. 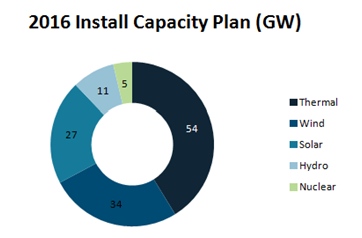 The wind development plan calls for continued capacity expansion by 2020, however, as seen in the chart above, 64% of new capacity additions, 64 GW, will be in southern provinces with less robust wind resources. This reflects central planners desire to ease high curtailment levels in the “three norths”, 三北, area of the Northwest, Northeast and North China grids. 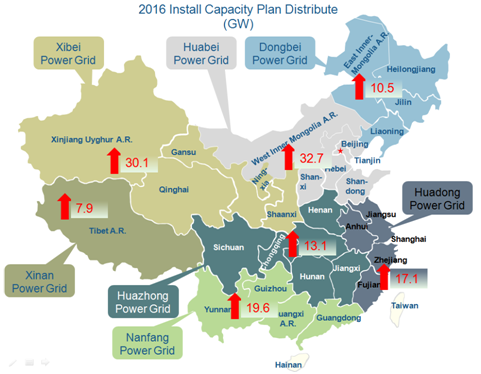 Provinces seeing the largest capacity increase to 2020 are Yunnan (7.9 GW, 191%); Hebei (7.8 GW, 76%); Jiangsu (5.4 GW, 131%); and Henan (5.1 GW, 559%). 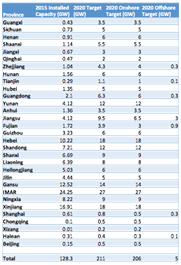 Provinces that saw the highest levels of curtailment in 2016, such as Gansu (1.48 GW, 12%) Xinjiang (1.09 GW, 6%) and Jilin (0.56 GW, 13%) are targeted for much smaller capacity increases. 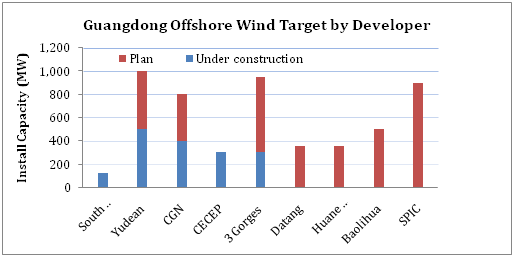 Offshore wind development is also emphasized, with Fujian set to build 3 GW, or 60% of total offshore wind, by 2020. During the 13th Five Year Plan, total investment in the Biomass industry will reach 196 billion RMB. Of this 196 billion RMB, 40 billion RMB will go towards power generation, 120 billion RMB for biogas, 18 billion RMB for biomass briquette industries, and 18 billion RMB for investment into liquid biofuels. CGN plans to connect 38 4MW offshore wind turbines using simple monopile foundations. 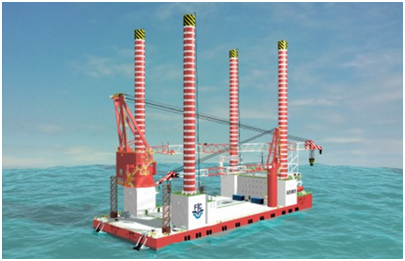 The 152MW offshore farm is forecast to produce 400GWh of power annually, equivalent to a coal power plant using 131kt of standard coal which would emit 267kt of CO2. Figure: A monopile offshore wind turbine. While not specified in the Solar Power Development Plan, under the Electricity Development Plan, the Solar Power target for 2020 further calls for 60 GW of distributed solar and 5 GW of concentrated solar, with the remaining 45 GW assumed to be standard utility scale solar. 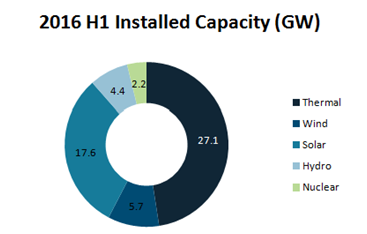 While the explosive buildout of utility scale solar projects in 2016 puts the current installation numbers at 77 GW at 2016 year end, the majority of this growth has been from utility scale projects rushing to completion before the large tariff cut in June. 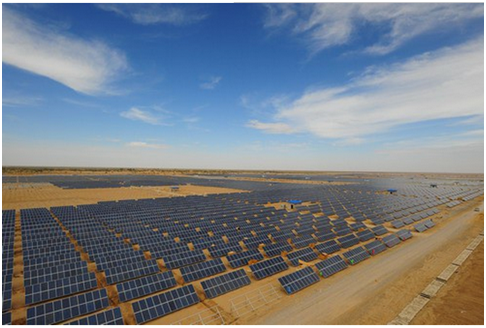 Currently distributed solar in China is hovering at around only 7 GW. Therefore while the 110 GW target will likely be surpassed, it is unlikely that distributed solar will be able to reach its sub-target of 60 GW.